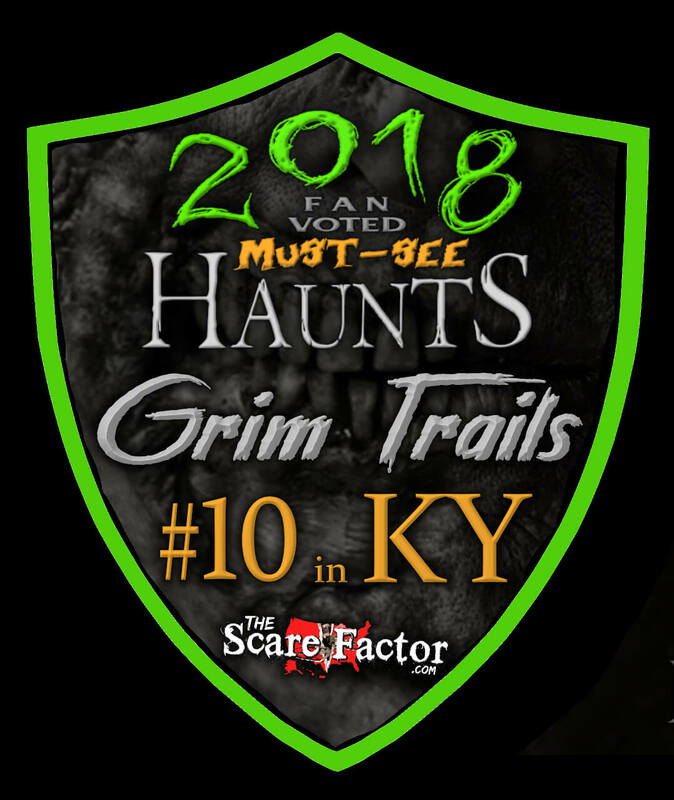 Team Zombillies reviewed this attraction on September 16, 2017. 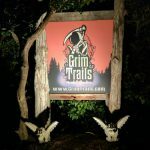 Grim Trails, now in their 5th year anniversary, continues to be one of the most unique haunted attractions we’ve ever been to! There are no chainsaws here. There isn’t a lot of blood and gore, either. Instead, you will be transported to a deep and dark fairy tale land. A land of things that only exist in myths and fables, but are far more sinister than you’ve ever imagined. A land where the stories you have come to know are nothing in comparison to what you will experience here. The warnings are true… they have turned. All things here have taken a deranged descent. Fluffy kitties will chase you, pigs are reversing the food chain and Dracula really does exist! Are you brave enough to jump into the madness within the twisting turns of this terrifying trail of tales? Will you elude the 6-foot snake before it strikes first? 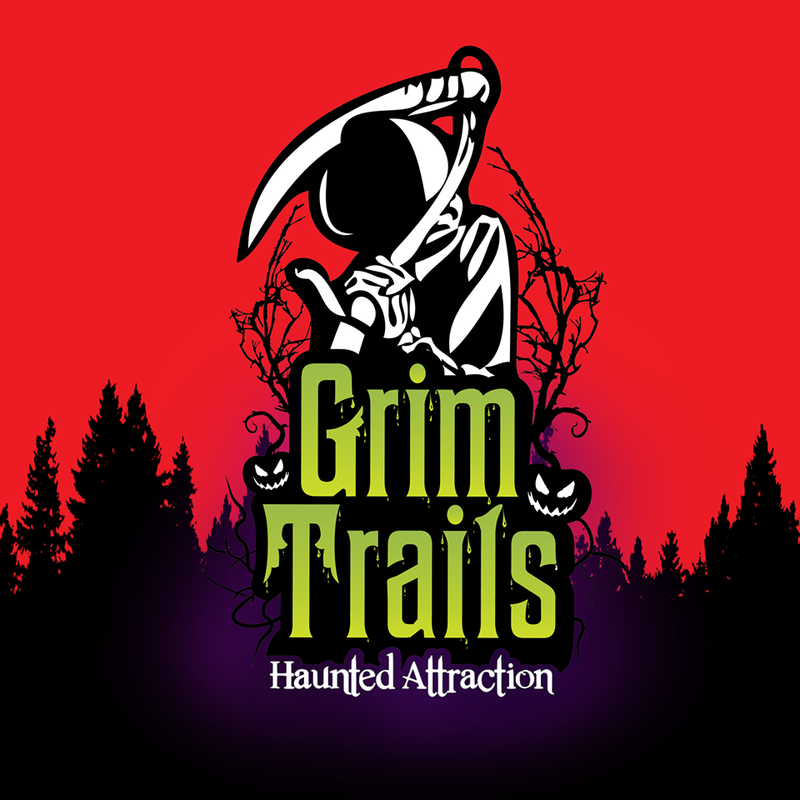 Find out first hand at Grim Trails Haunted Attraction. Grim Trails was fully-staffed during our visit and we must say that the creatures did a pretty good job of keeping the entertainment flowing throughout the scenes. Of those that spoke, dialogue was always scene-related and, at times, interactive as well. The Mad Hatter had some improv to throw at us when we questioned some items in his scene and the vampire who greeted us to Dracula’s Castle explained the reasoning behind their “interesting” lawn ornaments. Some were able to disguise their actual voices quite well, which helped bring the characters they were portraying to life! Such was the case with the pumpkin and the sheep. A lot of the characters gave enthusiastic performances. The pig and Cheshire Cat – while never touching us – were two of the most physically interactive characters we came across. The pig succeeded in momentarily splitting up our group and the cat literally came out of nowhere… hissing and jumping at us on all fours while turning his head as if it were floating. Gretel was climbing all over her scene and the rabbit was jumping around exuberantly, seeming extremely excited to run into us! But, it wasn’t all fun and games for long. Soon, our run-ins with the actors turned to desperate pleas for us to protect ourselves, warnings of our impending doom, blood-curdling cries for help and vicious attacks from the witches, giant creatures and other dark beings along the trail. Grim Trails really thinks outside the box when deciding which characters to feature at the haunt. In fact, we’ve had to ask the owners several times who some of them were! But, with that insight, we can say that each and every one of them do, in fact, fall under the myth / fairy tale theme quite appropriately. We can also say that you’ll be hard pressed to find any of them duplicated at another haunt in the area. Most of the costumes are custom designed for the characters here. Some of them include giant costumes, full-faced, silicone masks, colored contact lenses and authentic, vintage dresses. Detail ranged from street clothes and simple cloaks to huge, extremely-detailed monsters that’ll send you running to your car in a heartbeat! Although, we did notice that a couple of the costumes were a bit incomplete. Makeup also ranged from simple, yet subtly-detailed designs to bolder, blockier applications, but each of them did help complete the characters’ looks… especially with some of the witches. Several of the monsters require masks to be able to tell who they are and those that were used seemed to be of excellent quality. No plastic Jason Voorhees masks here! Another fun fact is that this is one of the only haunts we go to where some of the costumes actually provide their own sounds. A few of the most unique outfits we saw include those worn by the freshly-turned-monster Dracula, the demonic goat, Tituba the witch, Gretel with her colored contacts and corseted dress, the mighty Skin Collector and Kaa. 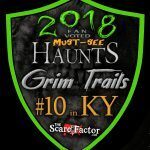 We followed our GPS and the Grim Reaper, (AKA, Grim Trails’ iconic, well-lit sign by the road) into the driveway that led to our haunted destination. An overhead sign displaying some of their characters greeted us as we pulled into the parking area, as well as several signs that were hanging on their new light posts down the center of the lot. Overall, the attraction was fairly easy for us to navigate. Yet another Grim Trails sign was found at the head of the parking area, which sits near a path that will take you to their cabin-like ticket booth. There was also a sign for the restroom (which is conveniently lit on the inside, by the way) and a well-marked path that led to the haunt’s queue line. But, before you get there, you’ll have to make it through a photo booth where pictures will be taken of your group (by a horrifyingly-exuberant cameraman, we might add) that can be purchased before you leave. Prices were 1 picture for $15.00 or 2 for $20.00. Since we’ve been here a few times, getting to the start of the queue line was easy for us. But we did notice several groups who were confused on which line to enter and what they were supposed to do when they got to the front of the line (the entrance staff lady was inside the first building giving out the rules, so there was no one outside to greet them). Despite their confusion, we did notice signs at the front of the line that will direct you on which path to take for the type of ticket you have. We encountered friendly staff at the ticket booth and entrance to the haunt who were happy to answer our questions. We must say the ticket taker did a thorough job at covering all of their rules and warnings! We also noticed a police officer keeping watch in the parking area for customer safety purposes. We arrived at the haunt fairly early, and although there wasn’t a long line, we didn’t notice any queue entertainment other than the tormenting sounds that were echoing up and down the path. Every now and then we could see people running away from something near the exit of the attraction, which was entertaining (of course, we wouldn’t want to ruin the surprise, now would we?). If the lines are long on busy nights, Grim Trails has added some benches next to the waiting line, which is a welcomed and appreciated feature. Once inside the trail, the path continued to be fairly easy walking. In the darker areas of the woodlands, there were always a series of small tea lights to help us see where we needed to walk. It is an outdoor trail that goes in and out of buildings, as well as up and down small inclines, so there is a little bit of uneven ground and possibly mud. Dress appropriately. We did notice some very uneven ground in one of the darker areas that’s covered in cloth, so just be sure to use some extra caution when you’re in that area. The driveway that takes you back to the haunt does go past a residential house, but don’t let this fool you; the atmosphere quickly changes once you get parked. As soon as we stepped out of our car, we could hear the faint whispers of some enchantingly chilling music. Multiple signs and decor reiterated the fact that we had, in fact, arrived at a spooky haunted attraction! 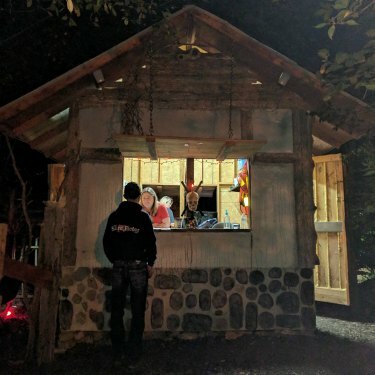 However, the real atmosphere here begins after you purchase your tickets…The owners of Grim Trails also have a landscaping business and some of their work – including carefully-placed lights, running water and a rustic bridge – is transformed into a part of the haunt’s entrance path. We’ve said it before and we’ll say it again…They have some of the most unnerving sound effects that we’ve heard in a queue area to date! Now, if you go with a larger group that’s being all loud and stuff, these sounds may be difficult to hear. But, if you’re walking down this dark path with just a few people, we guarantee that many of you will get chills hearing these creepy sounds. Not only did they help prepare us to enter a spooky attraction, but they also kept us on edge and wondering if what we’d just heard was real… or just a figment of the haunt’s wicked imagination! Along with such a unique haunt comes an assortment of scenes and special effects. Although this is an outdoor haunt and there are quite a few open areas, many of the scenes take place in buildings, castles, catacombs, cabins or other structures, each with a varying level of detail. As some examples, the buildings for the three little pigs, and Hansel and Gretel lean towards a rustic, weathered look and aren’t quite as detailed as some of the other areas that can be found here. In contrast, Dracula’s castle and the Jungle Book temple are much more awe-inspiring, well-decorated and impressive. Lots of ambient sound effects accompany the scenes and most of them do a good job of adding an extra dimension to the experience. Most of them are quiet and subtle, though, and don’t seem to be meant to be overpowering. Instead, they more so serve as a filler when the actors haven’t captured your attention yet. There are, however, sounds that come directly from some of the monsters you’ll see, such as the dragon and the demonic goat. Those, when used, worked well to help grab the attention of and instill fear into the members of our group! Another important part of bringing these fairy tales to life is the scenery that surrounds them. Some of the props and decorations you may see include an antique, horse-drawn hearse, bamboo thickets, impaling spikes, a life-sized, ‘live’ dragon, a ghostly door, a conniving corpse, a striking snake, carved-out pumpkins, a rope bridge, burning witches, a waterfall, several large and new surprises for this year and more! 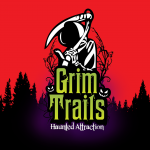 One last thing we noticed is that Grim Trails has been phasing out their black fabric trail dividers that we’ve seen in previous years and is switching them over to real wooden slats. This seemingly minor change, though surely time consuming, made a wonderful difference in the trail’s realism and helps maintain the believability of the scenes. During our visit, we never did actually have the theme explained to us. It can, however, be found on the homepage of their website. It all boils down to fairy tales. Yes, the ones you remember as a child. But, what you DIDN’T know about them is that they have a much darker side. An EVIL side… and these you can see at Grim Trails Haunted Attraction. As a rule, it was pretty easy for us to tell which tales we were approaching with just a quick glance around the area, but there were exceptions to this for our group. In the haunt’s defense, we hadn’t heard of all of the characters they were attempting to portray before our visit. However, after a brief Q&A with the owners and a little bit of follow-up research, we can now say that most people who are familiar with most of the classic fairy tales and myths should be able to pick them out fairly easily. 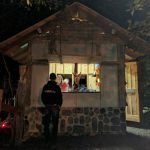 A variety of fright techniques were encountered along our adventure. We were paired with another group when we went through, so we were able to watch their reactions as well. Many of the villains succeeded in startling us just by popping out of their hiding spots! Timing was a bit delayed at times and it seemed like they tried to go for the front half of the group most often. That’s not to say that the back of the group didn’t receive some scares too. There were several times when we turned around and something was following them or had jumped in the middle of our group to try and separate us! When you approach the end of the haunt, you’ll be walking into a very bright light (the universal sign that the end is near). We won’t ruin the final surprise, but it’s very hard to predict. We knew what it was before it started coming after us and it still manages to get us every year! 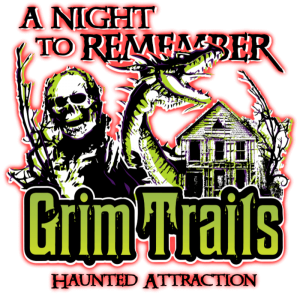 General admission will cost you $20.00 per person to witness the horrific twists on some of your childhood memories and other familiar tales that Grim Trails has to offer. It took our group 25 minutes to walk their 3/4-mile-long trail, bringing their MPD (minutes of entertainment per dollar spent) to 1.25 which is slightly below the average of 1.5 that we see most often. Despite that, this is still a good length for a single attraction haunt in the Louisville area. They also have group rate information for groups of 20 people or more (info is available on their website).